1999 Peterbilt 379 Truck Tractor. 10 speed, Cat 3406E, 450 HP, 22.5 rims, Alpine bunks, Electric Scales, about 50k miles on rebuilt engine. Air Leaf Suspension. 38K rears. Air ride cab. 2000 Peterbilt 379, Fresh Cat C15, 550 HP, 38k rears, 10 Speed, Interlock, Air/Leaf Suspension, Electric Scales, 3.90 ratio. 80% rubber, 243″ wheel base, 11R 22.5 tires. Used as a Log Truck. About 500,000 miles on chassis. 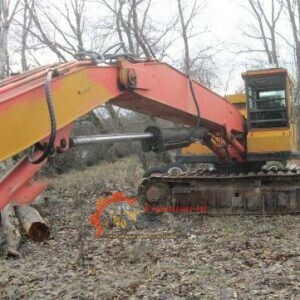 2005 Tigercat LX830 Tree Saw. Equipped with a Tigercat ST 5702 Head, U/C @ 40%, hour meter reads 14728. This is a good functioning machine that is ready for work. Rotobec Grapple, U/C @ 50%, 8.3 Cummins motor, Runs and functions great! Only 7000 hours on this machine! Pump Drive Seal leaks and needs replaced. The 2000 CW Manufacturing model TCII1564P Grinder. Has a Caterpillar 3412 990HP Engine that was completely Overhauled by Caterpillar. This unit Operates good and has been well maintained. Log Max 7000 Processing Head, New Planetaries, U/C @ 80%, hour meter reads 0777 hrs. Good running machine, ready for the woods! Estimated year 2000 Shop Built Tumbler Dryer. 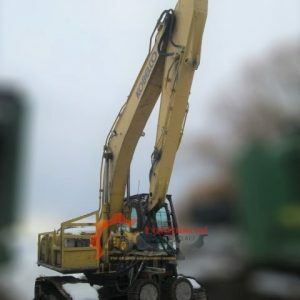 Has Caterpillar Engine, Feeder Hopper, and two conveyor belt feeders. This unit is used for Drying Wood Chips, Pellets for feed or energy. It has used portable heaters in the past, you can mount a permanent heater if desired. It has a large Steel Drum 24’ in Length an 40” in Diameter. You set the angle for the drum when you set up the machine. Everything Works. 1992 Western Star 4964F Log Truck and Trailer, Heavy Set 46k 2 speed rears, leaf spring suspension, 18 speed, Detroit Series 60, 450 hp, 3.90 ratio, 11R 24.5 wheels with excellent rubber on truck, 80% rubber on trailer, lift axle (22.5). 215,000 miles on in-frame rebuild. Reman’d Transmission/Clutch a year later. Cummins motor, Almost new U/C, Very clean and good running machine. Just freshly serviced and ready for the woods. Hour meter reads 20382.